Product #21355 | SKU H-FS1442AE-K | 0.0 (no ratings yet) Thanks for your rating! The LUMIX G VARIO 14-42 mm / F3.5-5.6 II ASPH. / MEGA O.I.S. lens for LUMIX G is based on the Micro Four Thirds standard and offers a versatile zoom range of 14-42 mm (35mm camera equivalent: 28-84mm) suitable for a wide range of situations from landscape to portrait. It also features the high mobility thanks to the ultra-compact size and lightweight, and the refined design that gives the LUMIX G digital single lens mirror-less (DSLM) camera a stylish look while adding to its snapshot creativity. 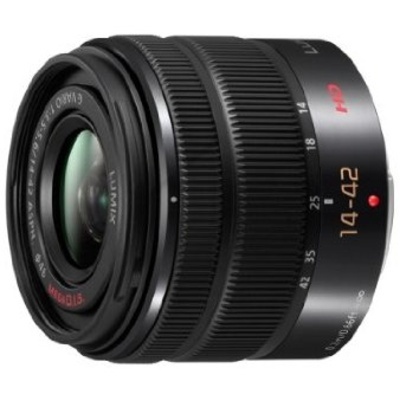 Comprising of 9 elements in 8 groups, the LUMIX G VARIO 14-42 mm / F3.5-5.6 II ASPH. / MEGA O.I.S. lens adopts 2 aspherical lenses to achieve further reduction of both size and weight yet maintaining its high optical performance at entire zoom range. The LUMIX G VARIO 14-42 mm / F3.5-5.6 II ASPH. / MEGA O.I.S. lens incorporates Panasonic's MEGA O.I.S. (Optical Image Stabilizer), which makes it easy to shoot super clear shots even in low-lit situations by suppressing the blur caused by a hand shake. The LUMIX G VARIO 14-42 mm / F3.5-5.6 II ASPH. / MEGA O.I.S. lens incorporates inner focus system driven by a stepping motor. When mounted on the cameras of LUMIX G, it assures astonishing comfort to take maximum advantage of high speed Contrast AF system and in video recording. With its minimum focus distance of 0.2 m (14-20 mm) / 0.3 m (21-42 mm) even at full zoom, the LUMIX G VARIO 14-42 mm / F3.5-5.6 II ASPH. / MEGA O.I.S. lens provides a maximum photographic magnification of 0.17x (35 mm camera equivalent: 0.34x). The 7 aperture blades consists a circular aperture diaphragm and produces an attractive smoothness in out-of-focus areas even shooting at large aperture.